Today’s Defence related-news involves a Daily Mirror report from Afghanistan, focussing on the contribution of UK and NATO forces there. The Daily Mirror travelled to Afghanistan to see the role the UK plays in the NATO Resolute Support Mission, which was reported on their front page and across several pages inside. The paper focuses on the threat posed to the UK by the Islamic State in the Khorasan and looks at the role the British troops play in reducing that threat. The piece carries comments from an interview with Major General Matthew Holmes, the Deputy Advisor to the Afghan Ministry of Interior Affairs. Also interviewed, in a separate piece, is Sergeant Scott Murray, who has already deployed on three tours in Afghanistan and is close to finishing his fourth with 1st Battalion The Royal Anglian Regiment. The Mirror’s visit is also covered in an editorial comment piece. Ultimately, the responsibility for defeating Islamic State rested with the Afghans. By empowering the Afghan security forces, enabling and advising them to stop terror groups getting traction, we help keep Britain safe. If terror groups see Afghanistan as an ungoverned space they can exploit it once more to plot attacks abroad. 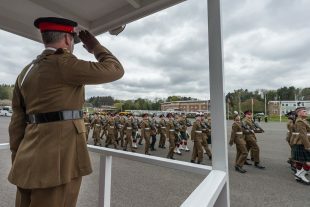 The latest recruits pass out of ITC Catterick in front of their families.